There is no more convenient way to replace a sandpaper disc than to simply peel a new one off a roll. With no individual pieces of backing to throw away, you have less to distract you from your work. 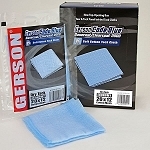 Rich Tool Systems carries some of the best 6" blue stick-on sandpaper rolls available. Harder than standard aluminum oxide, improved grain orientation and a special anti-loading agent all make this some of the best sandpaper you will ever use. Comes in a variety of grits, 100 discs per roll. 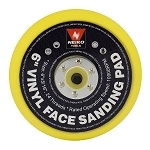 We also carry a 6" vinyl backup pad to help you utilize our stick-on sandpaper discs in curved or concave areas.